SaltScape Solutions is an agronomic consulting firm specialized in golf course construction and renovation using Seashore Paspalum. The owner of SaltScape Solutions, Stew Bennett is the breeder and patent holder of several of the industries newest and best varieties of Seashore Paspalum. Stew is a Certified Golf Course Superintendent and has 25 years of experience as a golf course Superintendent and Owner and 13 years breeding, growing and testing Seashore Paspalum. There is a lot of new activity focused around paspalum right now and Stew is one of the true pioneers in the field of Paspalum being irrigated with poor-quality water and grown in harsh environments. 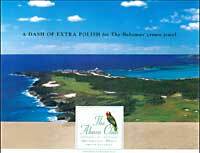 The photos above are of the just-completed Abaco Club on Winding Bay, in The Bahamas. SaltScape Solutions was the agronomic work horse that assisted the Club in obtaining its final goal of producing the world’s first “Tropical Links Golf Course”. The golf course opened two months early and after two hurricanes thanks to Paspalum and the hard work of many key people involved with the project. Click here to see the ad in Continental magazine. Click below for more information. SeaGreen, SeaDwarf and Stew Bennett help achieve #6 ranking internationally by the Toronto Star!